Why choose Landa's SEA series? 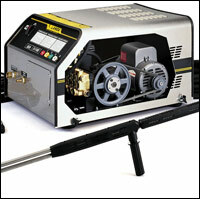 The SEA is the absolute top-of-the-line stationary, cold water pressure washer on the market today. The SEA features Landa belt-drive pump with U-seals for indoor cleaning applications, from food processing to warehouse cleaning. 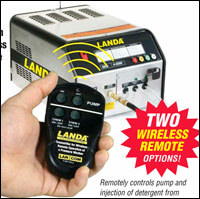 It is available with optional LanCom wireless remote. Add portability to the SEA with optional Wheel Kit (stainless steel model #8.904-527.0 or mild steel model #9.801-031.0), including detergent jug holder. 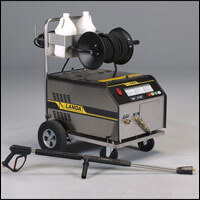 Optional Hose Reel (#8.903-521.0) provides tangle-free handling of up to 100 ft. of high-pressure hose. Industrial-grade Motor is connected to the rugged, class-leading, tri-plunger, oil-bath Landa LT (stainless steel model) or LM (mild steel model) High-Pressure Pump (with 7-year warranty) by dual, heat-dissipating V-cogged belts. Pulleys are made of cast iron and can be easily adjusted by turning two bolts. Remotely controls pump, burner, and injection of detergent from 1-2 sources | Controls from up to 300 feet away | Saves energy with easy shut down of unit when not in use | Saves time in changing commands while away from the main unit.